"I was there-- we were having my going-away luncheon at the Three Horseshoes when the planes were coming in that day. Being a communicator, I'm not up to speed on all of the aviator terms, but I'll do my best to describe what I witnessed that afternoon. The pub, which you know sits at the west end of Camp Road, is within rock-throwing distance of the runway, though we preferred to throw rocks at the peace campers. A few of us were outside and away from the main group recounting my "war" stories when the planes were coming in for the day. It was a typical day in the armpit of USAFE. A couple of pints, rattled teeth, and an F111 enhanced hangover headache. At least until the last plane came in on approach-- my supervisor remarked, "that doesn't sound healthy!" Our attention was focused a little north of the village proper (Upper Heyford) on the plane coming in about 200 feet off of the ground. The jet was making a horrible sputtering noise and looked to barely be in control-- I can only describe it as a wobbly wing-flapping with the wing tips alternatively going +/- 25-30 degrees with the right wing dipping furthest. Just after clearing the road that skirts the village (Somerset Road, I think), and about 100 feet in the air, the plane rolled almost 150 degrees to the right going almost fully inverted. There was a small explosion less than 2 seconds before the plane went in just over the perimeter fence and impacted in a field just south of the runway. It appeared to us that the crew ejection capsule had shot straight into the ground. 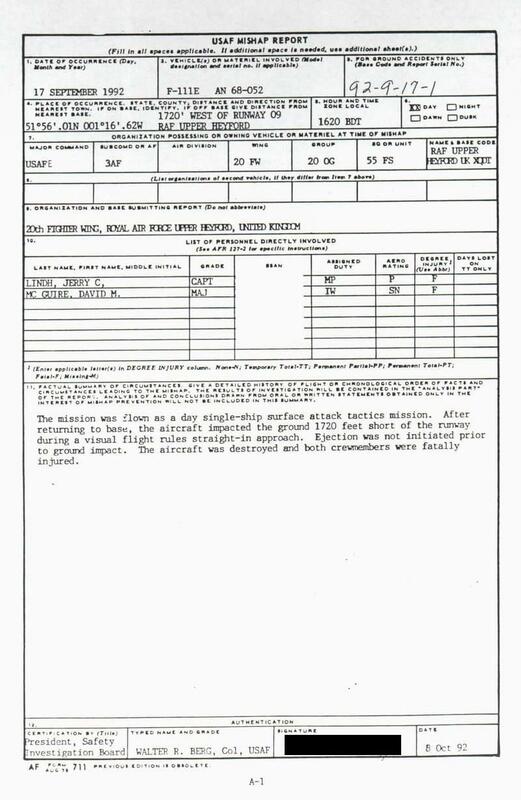 We were later told by a friend in the RAPCON that the pilot reported a total hydraulic failure during the approach pattern. Both crew members were killed instantly upon their capsule's impact. 10 Oct 90 - 12 Oct 92"